Convince all three alliances to invade Coldharbour. Stirk — Convince the three alliance leaders to attack Coldharbour. I convinced the leaders of the three alliances to meet to discuss a plan to attack Molag Bal's realm of Coldharbour. The meeting takes place on the historic island of Stirk. Hopefully, the meeting will go smoothly. The summit takes place in the ruin's center, southeast of where you arrived on Stirk. Galerion will greet each expert as you make your way up the path. The experts include Lady Laurent, Telenger the Artificer and Captain Alphuary. Ayrenn speaks first asking the other rulers to put aside their differences. 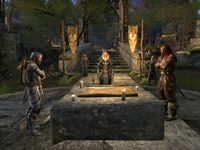 However, King Emeric questions the meeting and asks if it is a ruse, a plan to divert Daggerfall and Ebonheart forces while the Dominion takes the Imperial City. Jorunn adds that he thought backstabbing was Emeric's favorite tactic. Ayrenn responds to both by replying that Molag Bal is more powerful than either of the other two alliances. Emeric refuses to help because he will not endanger his kingdom based on the words of Jorunn or Ayrenn. Galerion interrupts their arguing, but all of the rulers have left the negotiations. You suggest to Galerion and Hakruba that the guilds lead the attack. Galerion suggests you visit each leader individually to propose the idea, while Hakruba reminds you of the non-interference pact that binds the guilds. In order to fight Molag Bal's forces across Tamriel, each leader must accept the guilds' presence in his or her realm. All three alliance leaders must consent to the new plan. Both Emeric and Ayrenn disagree with Jorunn's stubbornness. However, you persuade Emeric and intimidate Ayrenn, who responds that she cares about her people and her legacy will be one of a bold and decisive leader. Talking to Jorunn reveals that he tried to get the other leaders to cooperate. Caldien, who has been announcing each of the rulers, suddenly drops to one knee and says, "He has arrived." 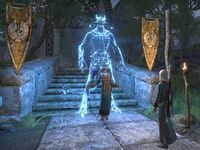 He pleads for Galerion to get away from him and run, then is struck by lightning, and Molag Bal appears behind him. Molag Bal plans to crush all three of the alliances because their leaders are all in one place. He announces his plan to rule all of Nirn and disappears, killing Caldien. The island is under attack. Galerion will prevent more rifts from opening, while Countess Hakruba protects the leaders and you close the unstable rifts. In the Ebonheart Pact area, the Skald-King is under attack from a titan called Sormorask. Ra'Lorka, a harvester, is attacking Queen Ayrenn in the Aldmeri Dominion's area, and Bitterwind, a storm atronach, fights King Emeric. Galerion announces that the time has come, and you follow him into the Portal Valley. You enter the portal and are greeted by Cadwell, who gives you some gold. I need to wait for Vanus Galerion to open the portal to Stirk. I wandered off before Vanus could begin casting the portal to Stirk. He'd probably like it if I returned. I need to enter Vanus Galerion's portal to travel to Stirk. I arrived on the island of Stirk. Now I need to talk to Vanus Galerion. I need to lead Vanus Galerion to the summit point, where the meeting of the alliance leaders will take place. The alliance leaders are arriving. I should listen to what they have to say. The alliance leaders can't reach an agreement. I should ask Vanus Galerion and Countess Hakruba what they think. I need to convince the three alliance leaders to agree to allow the Fighters Guild and the Mages Guild to bear the brunt of the assault on Coldharbour. I should talk to each of them in turn. I spoke to the alliance leaders. They seem willing to allow they Guilds to take the fight to Molag Bal, but still they hesitate. I should let Vanus Galerion know where things stand. Molag Bal has opened unstable rifts to the island and sent creatures to assassinate the three alliance leaders. I need to defeat Molag Bal's minions, protect the leaders, and close the unstable rifts. I closed the unstable rifts and saved the three alliance leaders. Now I should talk to Vanus Galerion. The alliance leaders have given the Guilds their blessings. It's time to finally take the battle to Molag Bal! I need to follow Vanus Galerion into the portal valley so we can make the final preparations. 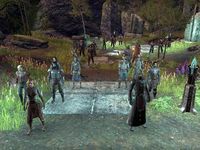 With the permission of the kings and queen of the three alliances, the Mages Guild and the Fighters Guild have gathered in the portal valley to open a path to Coldharbour. I should talk to Vanus and make sure we're ready to go. I need to wait for Vanus Galerion to open the portal to Coldharbour. The invasion of Coldharbour has begun! I need to enter the portal to reach Molag Bal's realm. arrived in Coldharbour, but I seem to be on my own. Well, except for that strange man over there. I need to speak to Cadwell. This page was last modified on 19 December 2018, at 13:21.